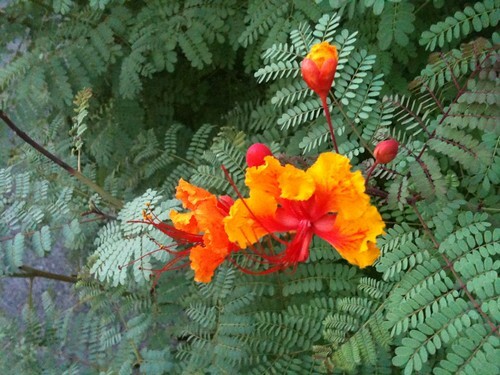 This bright flower stopped me in my tracks last night. The brilliant color and desert adaptations (green bark, tiny leaves) drew me in for a close look. I love seeing different flora and landscapes when I travel, even when that flora is dry dry pastures and landscape is full of creek beds. Seeing the Texas drought this year makes it easy to imagine the dustbowl of the Great Depression. I hope this drought ends soon. Today, I found a tiny bit of time to find yarn while traveling for work. 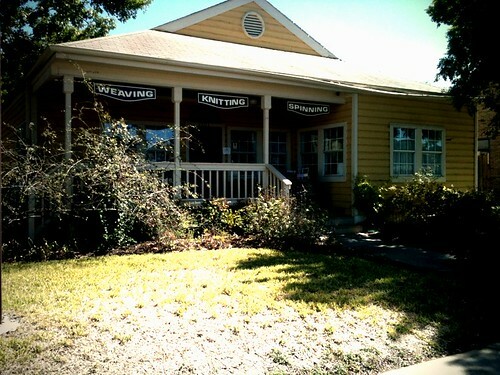 I spent a lovely half hour or so poking around in Hill Country Weavers in Austin. I bought one tiny ball of lace weight yarn to knit a Christmas gift for someone, a shop pattern, and a magazine. I hope to go back next time I'm in Austin to poke around a bit more, find more tasty food in the neighborhood, and find the spinning and weaving parts of the shop. In June, I prevailed over a skein of Trekking XXL that had thwarted all my attempts to turn it into a pair of socks. Many years ago, I bought a skein of yarn. I planned to knit chevroned socks from it. That early in my sock knitting career, I had not figured out exactly how to fit socks to my feet. I did not know that chevrons take away the elasticity of knitting or that my instep requires a lot of extra stretch. I started 3 or 4 different socks from this yarn, and none of them streched over my heel. But I stubbornly insisted that this yarn would be chevrons. 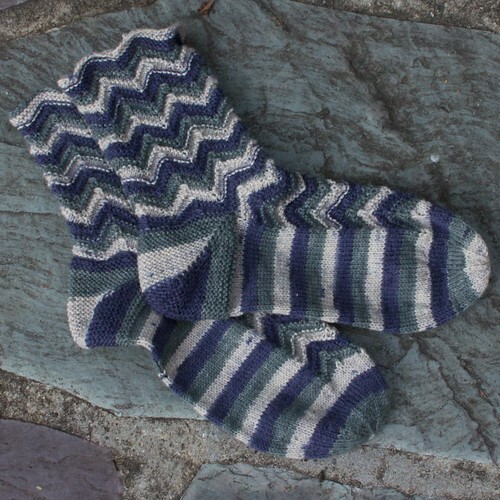 This spring, I found a chevron pattern with some stretch, and knit it up in about 2 weeks. I finally have the pair of green and blue chevron socks I dreamed about for years. Made coils with Jacey Boggs. Learned how to handcard fluffy rolags with Andrea Mielke-Schroer. 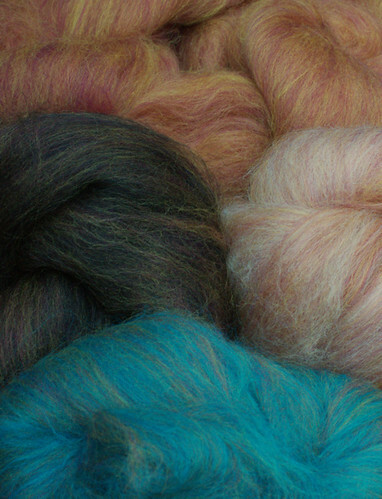 Turned those yummy rolags into sproingy woolen spun yarns. 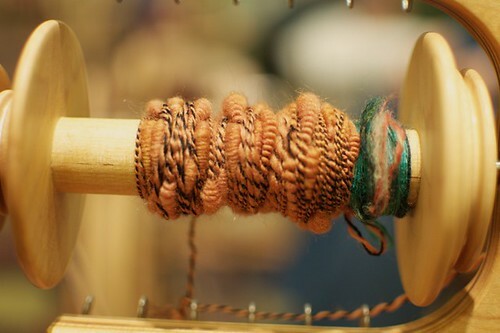 Spun cotton on a takhli with Stephanie Gaustad. Sampled seven rare breed wools with Deb Robson and put my new hand carding skill to good use with some of them. Spent the last hours of SOAR spinning with many friends in my hotel room. I took pictures ofbthis, but they are all unflattering, so I'm not going to share any publicly. Introduced friends to D, the little red airplane, and the wonders of aerobatic flight. Watched the first half of the Patriots and Packers games. Picked up big sticks so D could use our brand new lawnmower. No wonder I was so tired all day Monday. I'm still recovering from SOAR. One of the amazing things about SOAR and all other knitting or spinning events is seeing hand knits and hand woven pieces everywhere. These nine socks were all knit by participants in my three day color workshop. 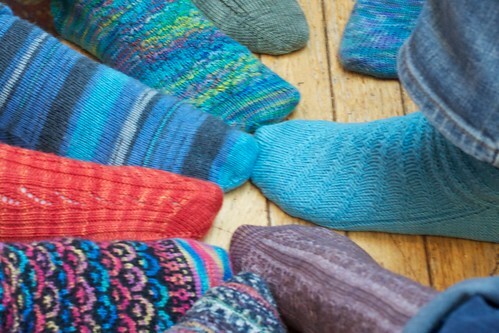 On any given day more than half of us wore interesting socks, shawls, or sweaters. The creativity and talent of everyone at SOAR—the mentors and the attendees—is stunning. As much as I learned last week, I think the real reason that I (and so many others) go to SOAR every year is to spend a week with over 200 like-minded creators. Experiencing that energy is the true power of the event. So many of us craft alone or in small groups all year and never really grasp the wonder of our community. 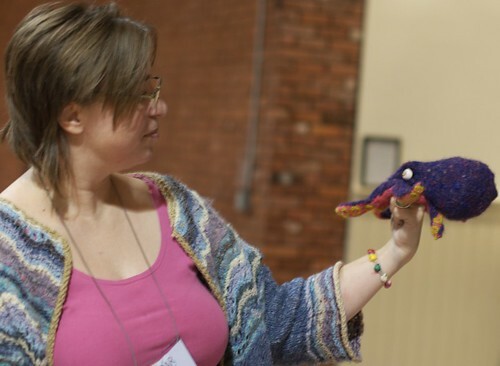 Ravelry, blogs, and other on line communities help, but do not replace the tremendous power of gathering and sharing. Is this something you have experienced? Are there ways we, as creators, can create more times and places to share, gather, and create together? I have a lot more I want to say about this, but it's late, and I have to leave early tomorrow morning. More soon, I promise. Now that SOAR is over, I am shifting my brain away from fun with fiber and back to every day life. The pile I left on my desk 7 days ago is scary, but I am not going to deal with it until tomorrow. Even though I want to spend the next month spinning the rest of my SOAR samples and practicing all the new techniques I learned (coils! And cotton on a tahkli and handcarding), I need to repack my suitcase for an adventure in Texas that starts Tuesday. I will be making more time for fiber on this trip (and in the rest of life). 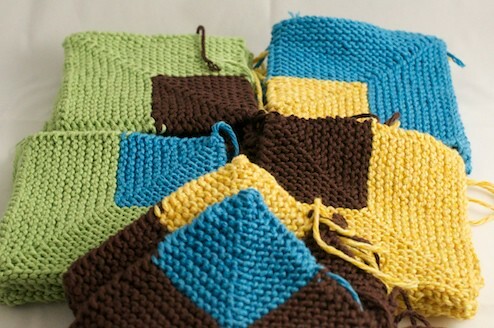 I'm going to toss something lovely into my travel spindle case and yarn for more blanket squares into my bag. Miss Z is nearly three, and I would like to deliver her blanket in time for Christmas. I would rather finish this one project than meet my 12 finished pairs goal this year. I watched Ingrid create this octopus all week fornher entry in Spinnerr's Poker. She won both the Excellence and People's Choice awards. This morning I learned how to intentinally spin useable thick and thin yarn. Then we turned that thick and thin yarn into the coils pictured above. I hope my hands remember what to do next week when I'm ready to try this again. 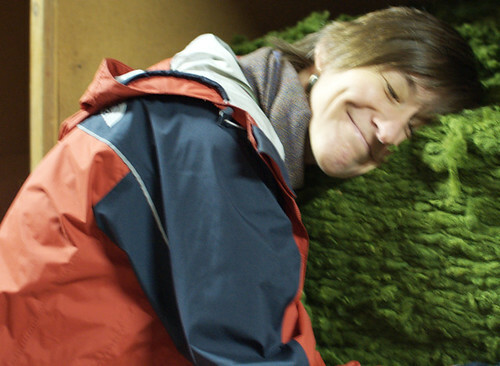 Diane snuggles into some dyed wool at Harrisville Designs. A group of friends took advantage of the day off from SOAR workshops to tour the Harrisville mill and do some shopping. I was good and bought nothing today, but made a list of things to order after I finish the next sweater in my queue. While blending colors today, all I could think of was < a href="http://www.willitblend.com/" target ="new">Will It Blend? I spun only a tiny bit today, but did a bunch of carding. The carder will be on heavy use as soon as I get home. I want to turn all the solid colors into blends.